As a marketer in hospitality, time is often limited. This is especially true if you’re a one-person hotel marketing show, or if you work on a small team with limited resources. With these constraints, it’s important to choose where you spend your valuable time and resources. For hotels, we usually recommend that you spend most of your time on the heavy-hitters: Facebook, Twitter, and Instagram. It’s also a good idea to cross-post content to Google+ for SEO value. But, one of the questions we get most often is, what about Snapchat? Should hotel marketers spend time on this social network? Remember, the rule of thumb when it comes to digital marketing and social media is, you need to be where your audience is. So the question you have to ask yourself is, does my target audience spend a lot of time on Snapchat? The answer to this question is going to vary depending on the specifics of your hotel like your location, the offerings you have, your brand, your guest experience, and the types of guests who typically stay with you. GWI recently released a report that might shed some light on the subject for you. 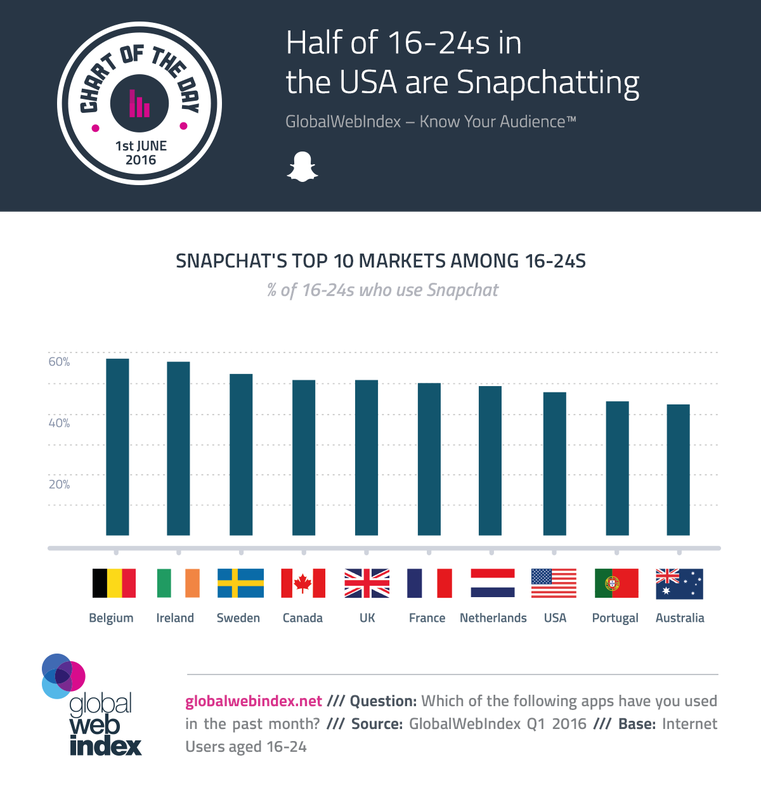 According to the digital consumer research firm, globally, just over a quarter of 16-24s are now using Snapchat, with these young internet users forming around half of its total user base. But as the chart below reveals, it’s in mature, Western markets where Snapchat has really been a hit. Usage among 16-24s reaches almost 6 in 10 in Belgium and Ireland, with equally high rates in key markets like the UK (51%), Canada (51%) and the USA (47%). So what does this mean for hotels? If you’re a hostel or an independent hotel who caters to a younger demographic, and if you’re in Belgium, Ireland, or the UK, Snapchat is definitely a social media channel with which you should experiment. With its impressive reach in some of the biggest and wealthiest mature markets, and a serious foothold among the younger demographic, it’s not totally a surprise that Snapchat may soon be valued as high as $20 billion and is fast becoming one of the most valuable unicorns out there.